Arrogance and innocence, hubris and hope—twenty-four haunting voices of the Titanic tragedy, as well as the iceberg itself, are evoked in a stunning tour de force. Millionaire John Jacob Astor hopes to bring home his pregnant teen bride with a minimum of media scandal. A beautiful Lebanese refugee, on her way to family in Florida, discovers the first stirrings of love. And an ancient iceberg glides south, anticipating its fateful encounter. 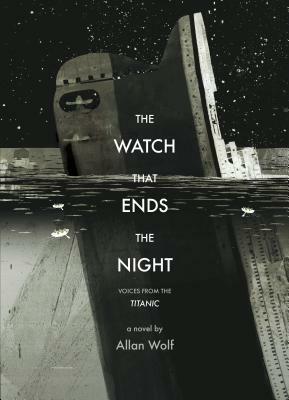 The voices in this remarkable re-creation of the Titanic disaster span classes and stations, from Margaret ("the unsinkable Molly") Brown to the captain who went down with his ship; from the lookout and wireless men to a young boy in search of dragons and a gambler in search of marks. Slipping in telegraphs, undertaker’s reports, and other records, poet Allan Wolf offers a breathtaking, intimate glimpse at the lives behind the tragedy, told with clear-eyed compassion and astounding emotional power. Allan Wolf, an expert poet and storyteller, is the author of the award-winning novels NEW FOUND LAND:LEWIS AND CLARK’S VOYAGE OF DISCOVERY and ZANE’S TRACE. He lives in Asheville, North Carolina. Wolf allows readers to experience the tragedy from all decks. This is a well-detailed and historically accurate portrayal of the events and brings the feelings and emotions of the characters alive. Moving... From their embarkation on the "great floating city . . . with its cargo of human hearts," the characters take turns relating their stories even as disaster engulfs them. The resulting record of the brief voyage gives readers an emotional punch. The strength of the effect is astonishing given that the ship sank nearly one hundred years ago and has been the stuff of legend ever since... Very enthusiastically recommended. Exhaustively researched, The Watch That Ends the Night vividly limns the naivete, the disbelief, and finally the hopelessness of the ship’s crew and passengers.